Here we are again, another Friday (Though as I type this it’s technically Thursday, but I won’t post until tomorrow, so for you, it’s Friday…) and here are the games I’m playing now. I’m going to start off with my current and then talk about my new ‘Game of the Week’… We’ll see how this goes – this post has been getting the most hits each week so I guess lots of people like it! Feel free to give me suggestions, etc… too! 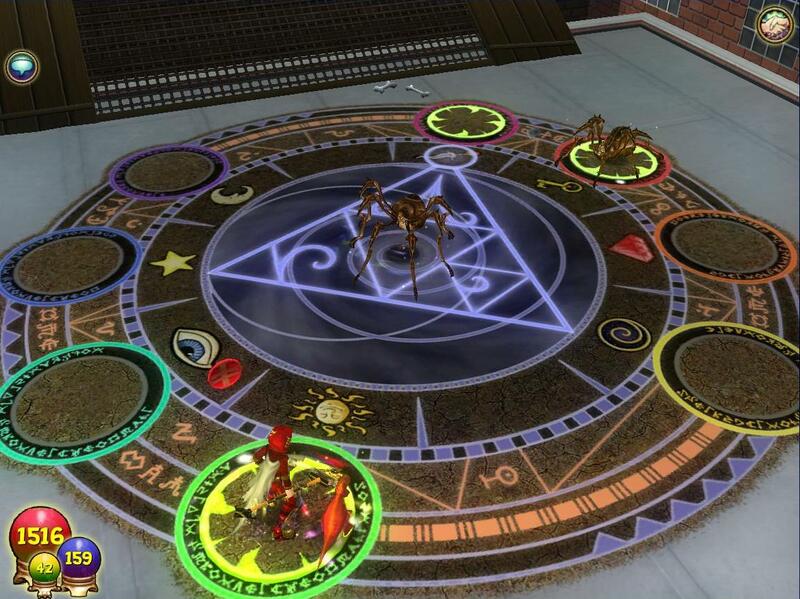 Of course I start off with my wonderful Wizard 101. Digby is still level 31, as I haven’t had a lot of time to play this week. currently he is fighting giant spiders in Hyde Park – why is it always Spiders?? I’m also farming scrap iron to finish up my crafting quests – that’s been really time consuming, and I never see it in the bazaar either. I’m almost there though – only a few more pieces needed to finish up my tasks. Yes, still playing, though again, not much this week. Ditto made level 15 and I got a nice surprise – he can add a surname, meaning he now has a first and last name! Of course that last name is Monster, so I am now a dwarf known as ‘Ditto Monster’! I am also trying my hand at crafting, or more specifically, ‘resource gathering’ – I became an ‘explorer’ who can gather wood and minerals and ore, natural resources, and supply other crafters with them, but not really ‘craft’ anything myself. That’s OK though – I think it will be a nice side income for me to get a house soon, which are EXPENSIVE!! 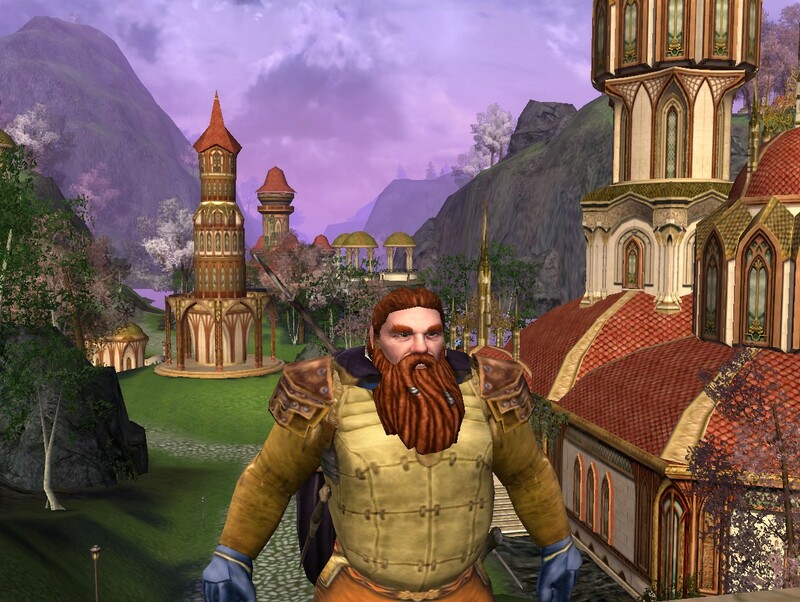 In Wizard 101 I had enough gold to get a house when I wanted one – in LOTRO I don’t know how I’m going to get that much cash without doing a lot of auction house selling and resource farming. One cool thing – I moved my happy little dwarf out of the cold and windy northern Dwarf areas and down into the lush green elf-lands! It’s so beautiful – kind of breathtaking really. Ditto finally made it to the lovely elf-lands! Some big changes in this game this week – they have added new ‘wild monster tribes’ that you can battle for a PVP-like experience without actually PVPing someone, and these tribes will attack you back. It is actually a big change in game play and overall strategy, because fighting these tribes isn’t about stealing resources like regular PVP, it’s all about protecting your town hall and taking out their town hall. I’m going to be re-designing my yard to better account for this, as right now my resources are really well protected, but my town hall is rather exposed. I’m not posting about this one after this week. I’m level 125 and I believe I’ve unlocked all quests, so now I’m just going through the motions. The Game of the Week!! Here it is, Ditto’s ‘Game of the Week’!! 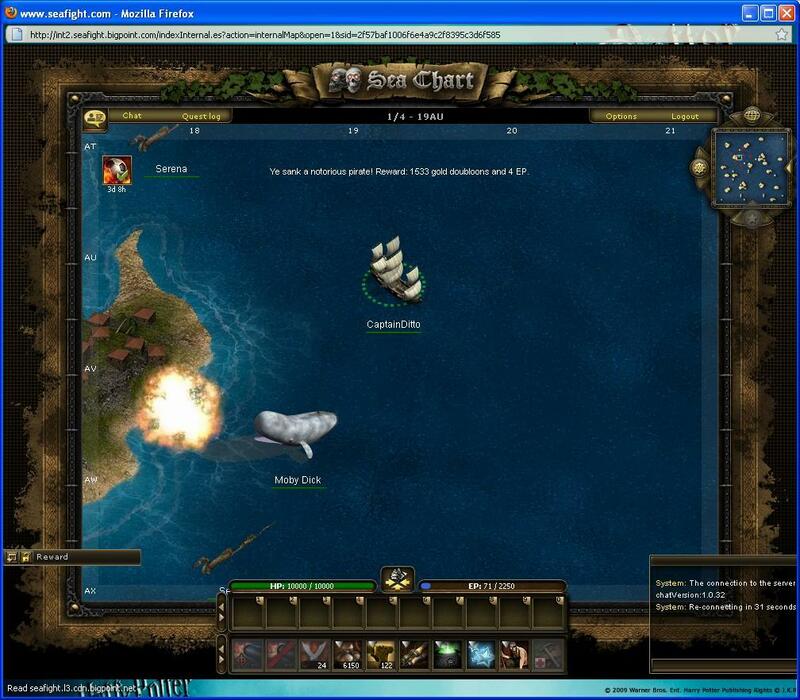 This week I will be talking about ‘Sea Fight‘, a Free to Play pirate game. I found this game thanks to an ad on Facebook while I was playing ‘Backyard Monsters’, and the concept is simple – you have a ship, you sail around, you kill sea monsters and sink other ships. Not much more to it. Overall the game is kind of a train wreck, sorry to say. The user interface is really simple, but that’s because you can’t do anything with it – to do anything other than sail around and kill sea monsters, you have to log out of the game, go to the website, and use the web-based interface there. And it’s not even a very good web-based interface. They do start you out well, with a decent ship and both in game gold and ‘pearls’, which I believe is the ‘real money’ currency, and that allows you to better outfit your ship with faster sails, more guns, ammo like exploding cannonballs and flaming pumpkins, plus a crew of swarthy pirates. All the ‘elite’ gear does cost real world currency, but it’s fully playable and pretty fun – though limited – with the in-game gold stuff. I haven’t tried PVP yet, which seems to be a BIG part of this game, so my opinions might change on the viability of the ‘free’ stuff if I come up against someone fully tricked out in premium gear. One of the crazy things about it is that you can complete a quest, but you apparently need to PAY to get the reward form the quests. Usually $.99 per quest. Seriously? That’s a bit crazy, sorry.. 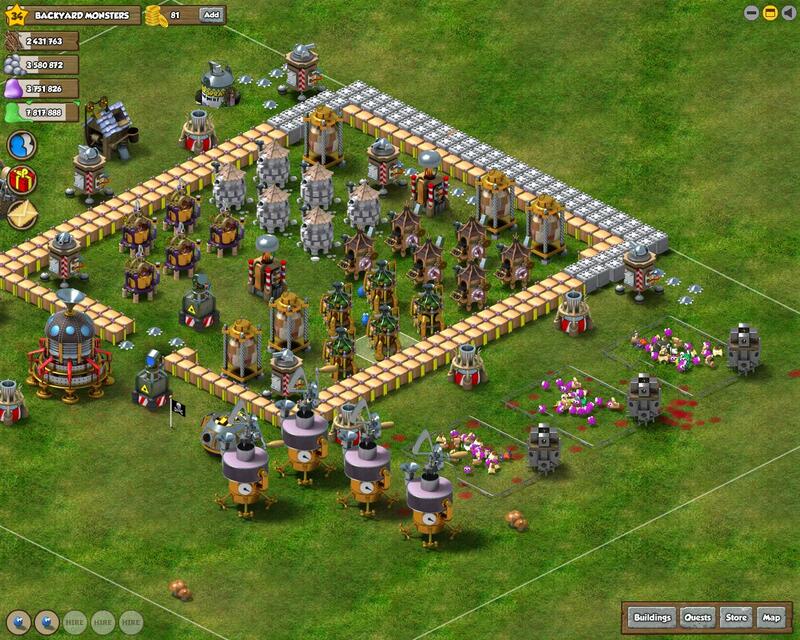 This entry was posted on October 8, 2010 by dittowizard. It was filed under Fabricated American, Gaming .